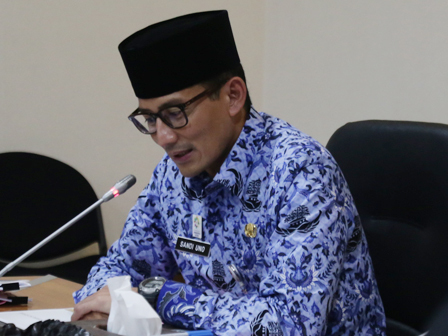 Jakarta Deputy Governor, Sandiaga Uno hoped, Jakarta Fair transaction this year could hit Rp 7 trillion and be able to absorb 6 million people.
" Jakarta Fair is an amazing event"
Sandi said, the large number of visitors and traders, either from small, medium, to large scale become part of the wheel of the economy. "Jakarta Fair is an amazing event. We hope, this year there could be a new record transaction worth Rp 7 trillion," he expressed, after conducting Jakarta Fair 2018 press conference, at JIExpo, Kemayoran, Central Jakarta, Monday (5/21). It is also able to create so many jobs. It is because it is participated by 2,700 participating companies in 1,500 booths that exhibit a variety of excellent products. "Before it opened, there were 30,000 jobs. And after opened, it could absorb 10,000 workers," he explained. In the event, Jakarta Provincial Government will also participate through a prepared pavilion. "We will display OK OCE activities. Our hope is Jakarta Fair can also becomes the arena of creation of new entrepreneurs," he stated. As for the information, Jakarta Fair 2018 will be held on May 23-July 1, 2018. It will take theme "Jakarta Fair to Succeed in MICE (Meeting, Incentive, Conference, and Exhibition) Indonesia in National Economic Development Process".